Metauranospinite: Mineral information, data and localities. Named in 1904 by Paul Gaubert for the dehdration relationship to uranocircite using synthetic material. Earliest natural report is unknown. 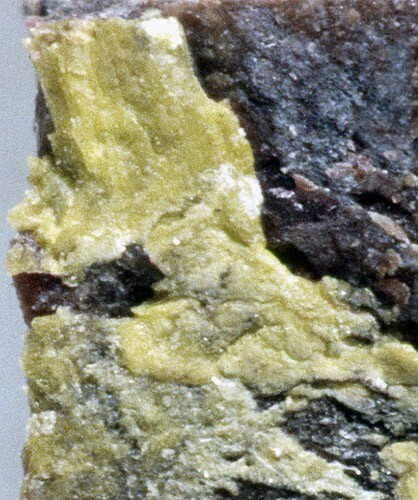 Metauranospinite does not appear in Frondel (1958) Systematic Mineralogy of Uranium and Thorium. Small square to rhombic tabular crystals. Synthetic uranocircite dehydrated in laboratory conditions. American Mineralogist (1953): 38: 1159-1168. American Mineralogist (1960): 45: 254. Walenta, K. (1965): Beiträge zur Kenntnis seltener Arsenatmineralien unter besonderer Berücksichtigung von Vorkommen des Schwarzwaldes. 2. Folge. Tschermaks Mineral. Petrog. Mitt., 9, 252–282 (in German). Bulletin of the Moravian Museum, Brno (1984): 69: 26. King and Foord, 2000, Mineralogy of Maine, Addenda to Volume 1.